I planned on cooking chicken tonight, I had already put a whole chicken in the refrigerator to defrost before I left for work this morning. While I was looking around at other blogs today, there must have been a cosmic chicken force at work because my regular food reads all had chicken! Check here, here, and here for example. I really had planned on making adobo, since it’s fast and easy. When I got home and announced what I was making, my husband said, “Let’s make a deal”. I almost said, “Already? But it’s still so early!” till I realized he was talking about the chicken 🙂 Ha! Ha! Anyway, he said, “If you fry the chicken, I’ll make you my special Chocolate ‘love’ Cake” with a sly smile. See, he knows just how to get me. No matter how tired I was from working all day, how can I possibly resist an offer like that? It’s CHOCOLATE for goodness sake!! I immediately took him up on the deal. I’m no fool. So, I made my version of southern fried chicken, which we like better as it is not as heavily battered as most version. It’s simple, and you know how I like to keep things simple. I’ve tried marinating the chicken, battering it, spicing it up, and they all came out pretty good, but I always come back to this tried and true version. Mix the flour, garlic powder, salt and pepper in a bowl or plastic bag. Wash and dry the chicken pieces, and dredge in the flour mixture. Fry in medium hot oil until golden brown. I use a cast iron pan for frying meats, it seems to give them a richer color, and they cook more evenly. Now on to the good stuff… I didn’t really eat any fried chicken, I was saving my appetite for what’s to come later, so I only ate some of the steamed broccoli. Now, don’t expect any recipes for this cake, because I am not the baker in this family. My husband has his own recipes for his cakes, and they are sacred to him. He won’t share it with anyone. That’s why I had to marry him. 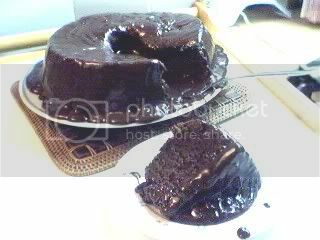 (just joking 🙂 This is the best ever chocolate cake, and we eat it while it is still warm. 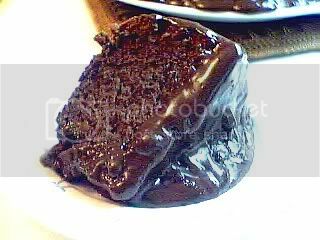 He pours on the ganache frosting while the cake is still warm, so it seeps in, and keeps the cake moist. It is heaven on earth. Yummy! 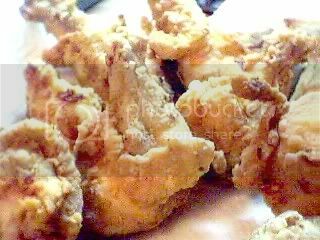 Wow may telephany nga yata – we had Southern fried chicken the other day! How much garlic powder and salt & pepper do you put in per cup of flour? My son said ours is matabang and I already put 1 tsp. salt in 1 cup flour. Oh, I also went to Celia’s but for some reason I never even realized that she had chicken too..oo nga ano?